In the summer, I was contacted by an editor at The Guardian who wanted to use my recipe for Sticky Boozy Chocolate Plum Pudding Cake in their 10 Best Plum Recipes article. I was very, very excited. It took a couple of months for the article to come out, and while I was waiting I’ll admit that I checked to see if it had been published yet a bit obsessively. This resulted in me looking at the 10 Best Almond Recipes that preceded the plum article over and over again. 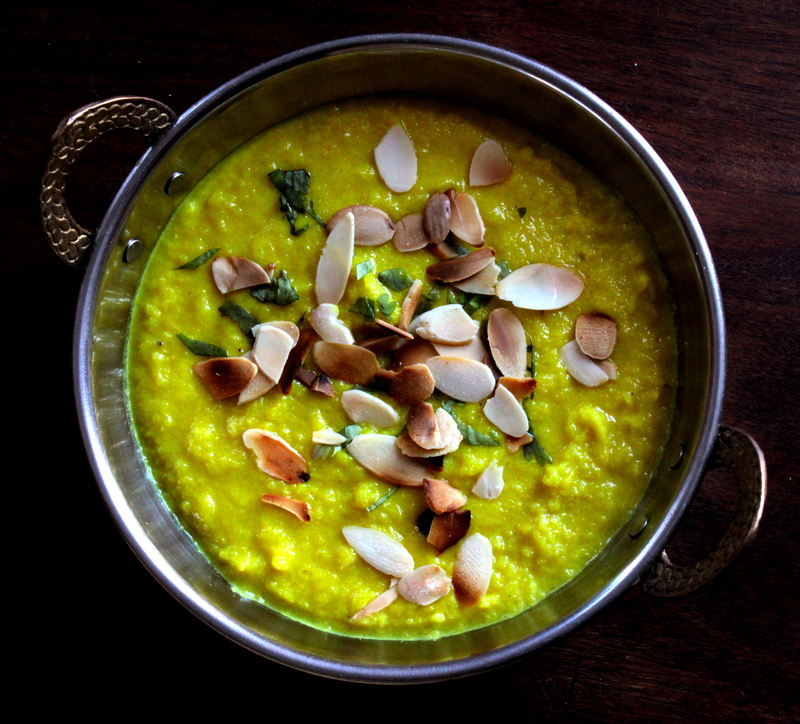 This Cauliflower Almond Turmeric Soup caught my eye every time. In recent years, I have become a rabid fan of cauliflower. Really, in the winter it is a rare week that I do not make a cauliflower dish of some kind (Cauliflower Gratin with Horseradish and Poppy Seeds, Roasted Cauliflower and Caramelized Onion Tart, Roasted Cauliflower with Gremolata Breadcrumbs, Gingery Cauliflower Soup, Whole Roasted Cauliflower with Romesco Sauce, Cauliflower with Sumac, Cumin and Lemon, Baked Cauliflower Kofta with Creamy Tomato Sauce to name just a few favourites). Cut the florets off the cauliflower and chop roughly. Quarter and slice the trunk. 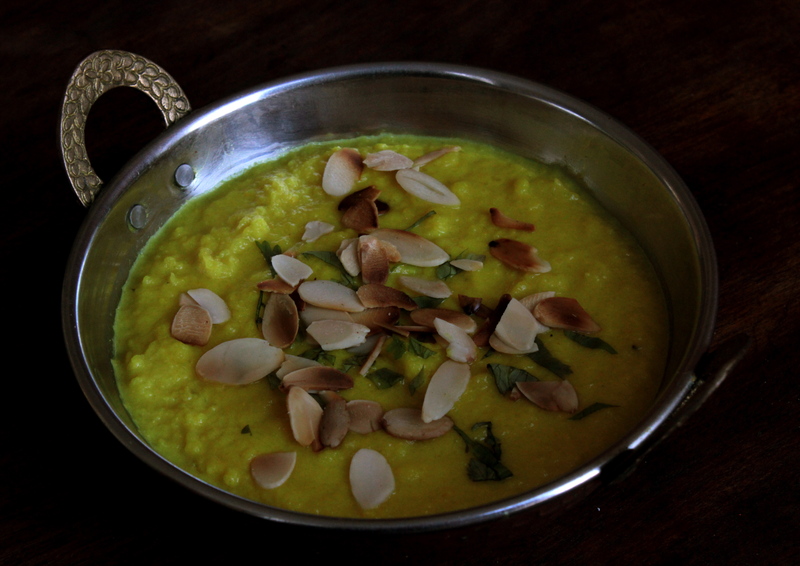 Melt the butter in a saucepan, add the onion, garlic, turmeric, fenugreek, ginger and sliced cauliflower stalk, and cook until the onion begins to soften. Stir in the ground almonds, making sure everything is well coated, then pour on the stock. Simmer for about 10 minutes, then add the cauliflower florets. 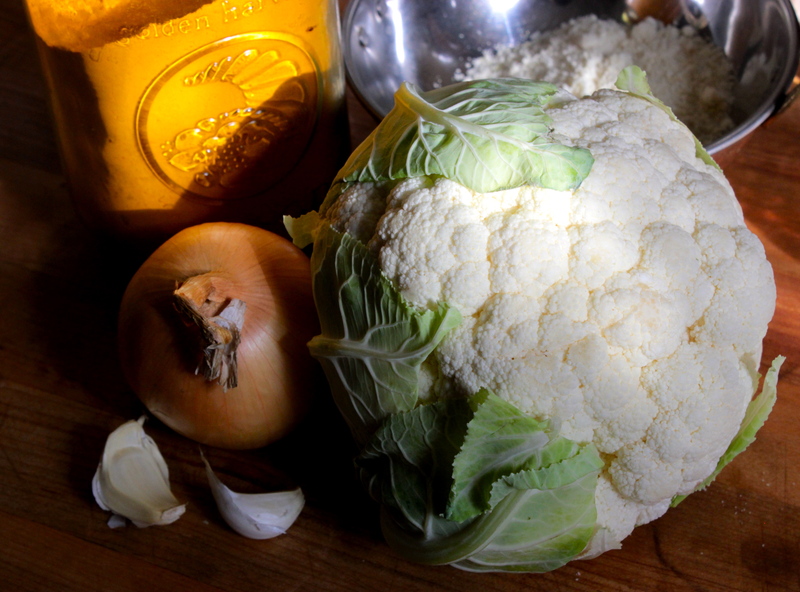 Simmer for 20-25 minutes, stirring occasionally, until the cauliflower is tender but not mushy. Stir in the milk, and process until smooth (I use an immersion blender). Season with salt, pepper and lemon juice. Top it off with some almonds and serve. Thanks to you, I’m sure my refrigerator will be stocked with cauliflower for months. I can’t wait to try this!